There are so many benefits to using event planning websites to plan your events. AllSeated has transformed the event industry from paper-and-pencil to an all-digital platform where venues, caterers, planners, vendors and hosts come together to collaboratively delight clients and grow businesses. Event planning websites such as AllSeated provide you with the organization and collaborative tools needed to efficiently plan your events while saving you time in the process. Event planning websites increase your level of organization which assists you in staying on task. With everything stored in one place, the planning process can be seamless while providing efficiency and time saving tools in the process. AllSeated offers you the ability to organize and manage all aspects of an event in one place.With all data updated in real time, keep accurate guest list information, arrange floorplans and seating with the option to view in 3D. Create multiple timelines for your events (such as a personal day-of and vendor timeline) which can be viewed side by side, helping you to easily see every detail and appointment planned for the day, providing an extra level of efficiency and organization! Event planning websites like AllSeated make it really simple to attend to every detail without getting sidetracked or confused. An event’s guest list, floorplans, seating arrangements and timelines can all include as many details as needed in order to plan and execute a successful event. Reports can be generated to provide full furniture inventory lists, guest information and guest counts, important notes and seating information. Event planning websites should provide collaborative tools, giving you an online space to work and interact with others on the details of your event. Easily invite your vendor team and clients into the AllSeated account to work together on the guest list, floorplans, seating and timelines. Go over floorplan layouts and seating details with the ability to do virtual walkthroughs in 3D without having to actually be at the venue! 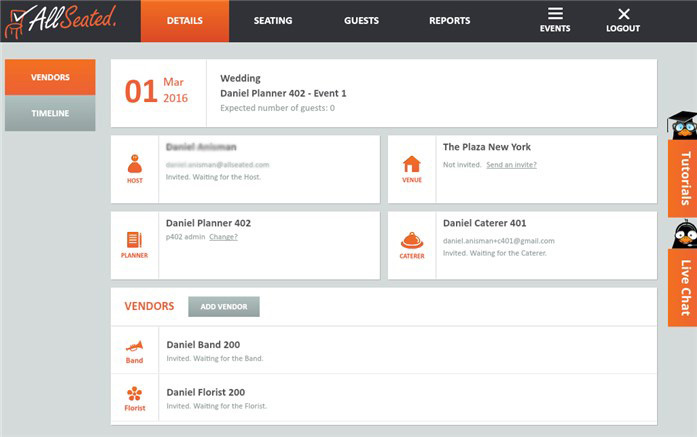 Event planning websites such as AllSeated make event planning less stressful as the tools are simple to use. 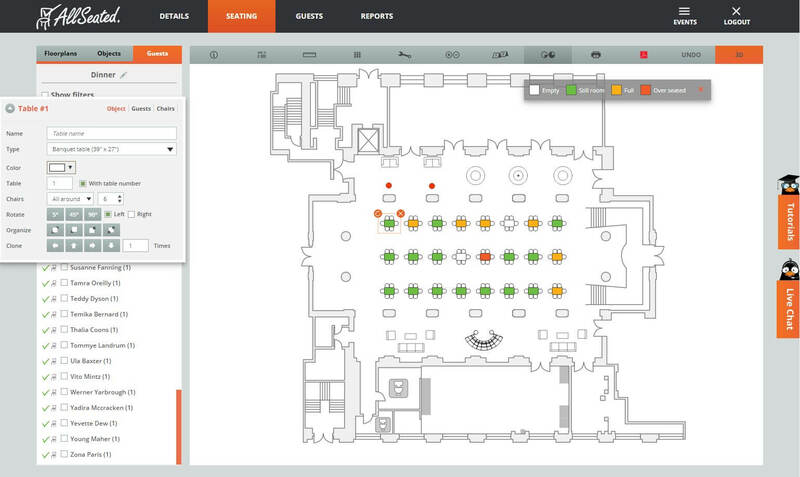 Plan your events without stress as you quickly create floorplans and layouts. The tools are interactive, collaborative and so easy to use that you will feel tech savvy in the process.